When you’re greeted with this special of a guest in the middle of your school day, you just might be as surprised as these Howard University students were Thursday. First lady Michelle Obama and her motorcade traveled just a few miles from the White House to Howard for a surprise visit to more than 200 freshmen, most of them majoring in business. She was accompanied by newly enrolled Howard freshman Nick Cannon, host of NBC’s America’s Got Talent, and Seth Meyers, host of NBC’s Late Night with Seth Meyers, who is a graduate of Northwestern University. The three were there as part of her Reach Higher initiative and Better Make Room campaign. They took questions from the students. The answers will be used for a segment that will air next week on Late Night. “I know I’ve told this story before, but when I applied to colleges, I had people who told me that I was reaching too high, that the schools I was applying to were too much for me,” Obama said. “And then I got there, and I looked around and I thought I’m as smart as these people, what were they thinking? Before heading into the crowd to take questions, Cannon explained why he decided to enroll at Howard. The three talked education, the importance of internships and the best way to de-stress when things get hard. Nick Cannon taking questions from a crowd of students at Howard University. “College was probably the most impactful thing that I have done in my life other than being the first lady and having kids and marrying Barack Obama. But college did everything for me. I mean, it built my confidence, No. 1. It taught me that I could leave home and be successful away from home. It taught me how to open up, how to try new things that are scary, how to buck expectations and beat the odds, and all that good stuff,” Obama said. She said she could not do any internships because she had a work-study job. But she stressed the importance of internships. “Some people need more practical experience — I know I did. And internships give you those opportunities to try some ideas for yourself on, to try some careers on,” she said. As a radio/TV/film major in college, Meyers said he was “lucky enough to know” what he wanted to do when he was a freshman. The first lady said laughter helped her to de-stress. 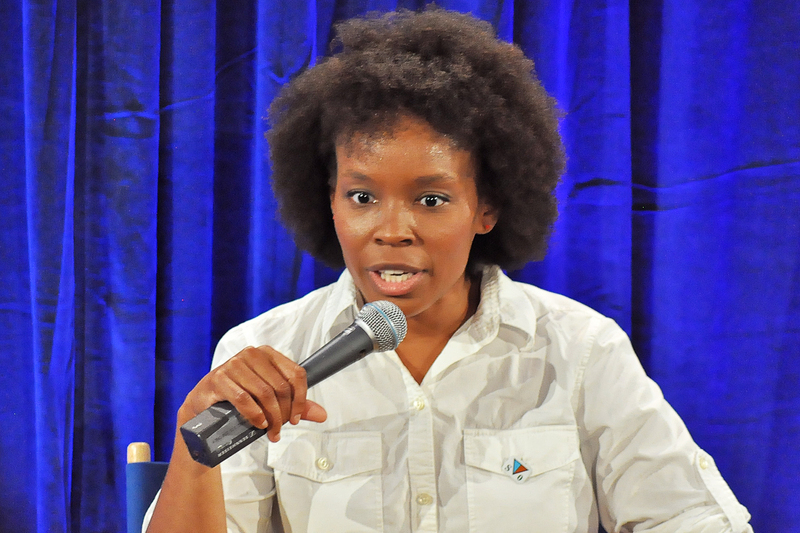 Also on deck to warm up the crowd was Amber Ruffin, the first black female writer on a late-night show. Launched nearly one year ago, the first lady’s Reach Higher initiative is a program to reach students when they are on social media and mobile devices by giving them advice and a place to celebrate education and get connected to important resources that will help them get to and through college.